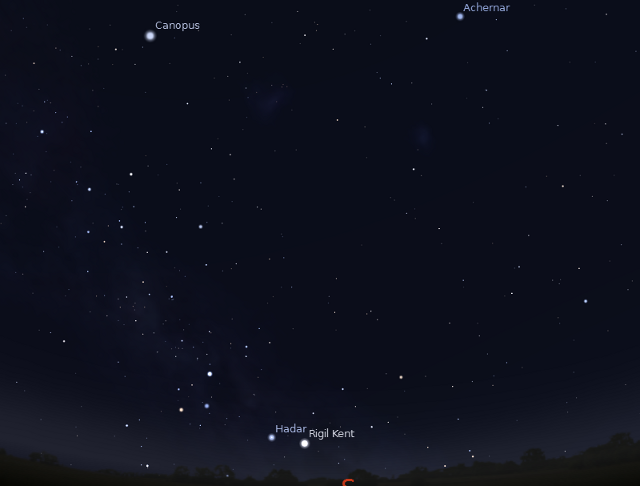 This month the planetary action is mostly in the morning skies. Venus bright in the east with Mercury and jupiter below it Saturn returns late in the month to the morning skies. Lonely Mars graces the western evening sky. Venus and Jupiter close. comet46P low in the north early in the month. January 2; Venus and the crescent Moon close in the morning. January 3-4; crescent Moon close to Jupiter. January 4; crescent Moon near to Mercury. January 9; Moon at Apogee. January 1-12 Comet 46P bright(ish) but really only visible in northern Australia. 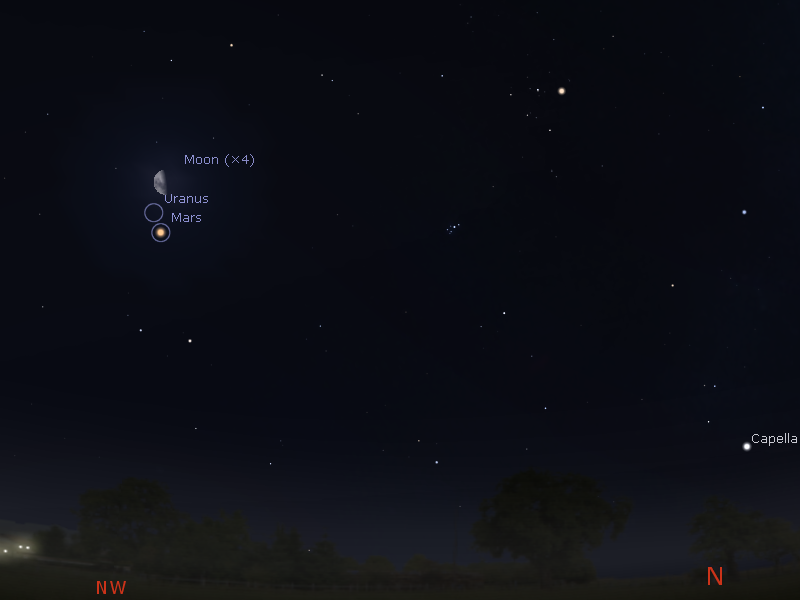 January 12-13; Mars close to the waxing Moon. January 14, Saturn and Mercury low in the morning twilight (difficult). January 22; Moon at perigee (near perigee full Moon, so called "super Moon" 21st). January 23; Jupiter and Venus close. Summer is here once more, and the beautiful constellations of Orion, Taurus and the magnificent rambling constellations of Carina, Puppis and Vela grace our skies again. The January school holidays will be an ideal time to head out somewhere dark and view the stars and planets at their best. Summer also means very long twilights in southern Australia, so you may have to wait to see these delights. Despite the warmth of the days, nights are often cool, so don't forget a light jumper before doing any extended star watching. A blanket or rug to sit on is a good idea. Some mosquito repellent will be a must. Aurora Alert UPDATED 28/08/18: Despite solar maximum having passed, we are still getting occasional good auroral displays. August 26th 2018 saw an impressive display visible from NZ and Tasmania despite the full Moon. The last week of March 2017 saw some impressive aurora displays from Tasmania, Victoria, SA and WA. September 2016 saw a series of good but transient aurora in Tasmania and southern Victoria. July 2015 saw a massive storm seen as far north as mid NSW, again clouded out for large parts of Australia. 17-19/3/2015, the St. Patrick's Day aurora, massive storm seen as far north as Southern Queensland. Unfortunately clouded out for large parts of Australia. 26/2/2015, yet another good set of aurora were seen from Tasmania. 9/2/2015 There was a series of very good auroral events during January, some were seen in NSW, Victoria, SA and WA as well as Tasmania. Last year saw some nice events and a coronal mass ejection from an M class flare hit us square on on March 17 2013. Aurora were detected as far north as the QLD border, with some really nice events in Tasmania, and here are some images from that event. The Sun is now at solar minimum,and is rather quiet we may see more aurora in the near future. Mars Curiosity Rover continues its journey . January 2; Venus and the crescent Moon close in the morning. January 3-4; crescent Moon close to Jupiter. January 4; crescent Moon near to Mercury. January 9; Moon at Apogee. January 12-13; Mars close to the waxing Moon. January 22; Moon at perigee (near perigee full Moon, so called "super Moon" 21st). The the morning sky on Wednesday January 2 facing east as seen from Adelaide at 5:15 ACDST 45 minutes before sunrise, Venus and the crescent Moon are close. (The inset shows the telescopic view of Venus at this time, similar views will be seen Australia wide 45 minutes minutes before sunrise). The evening sky facing west on Sunday January 13 facing west as seen from Adelaide at 21:18 ACDST 90 minutes after sunset, the nearly last quarter Moon is close to Mars. 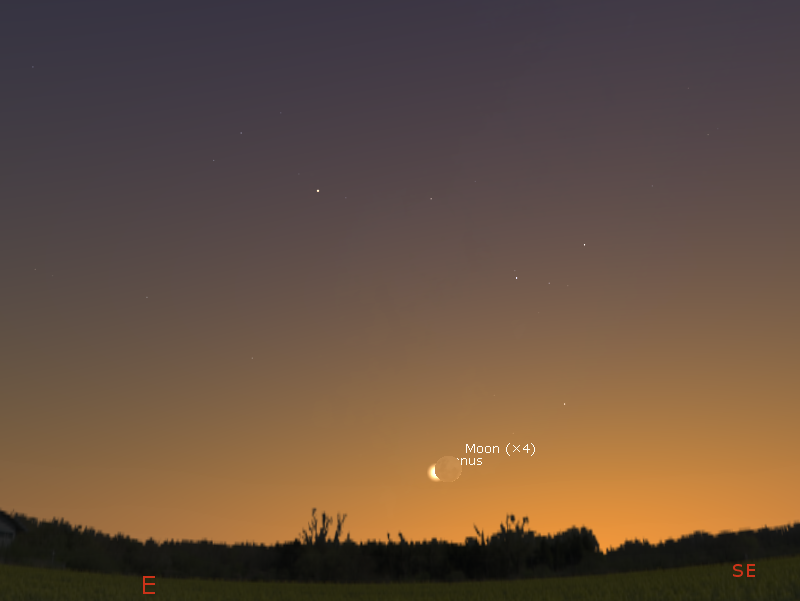 (similar views will be seen Australia wide 90 minutes minutes after sunset). The the morning sky facing east in Adelaide on January 23 at 5:11 ACDST 60 minutes before sunrise. Jupiter and Venus are close (just over 2 finger-widths apart. (similar views will be seen from other cities at the equivalent local time 60 minutes before sunrise). Mercury is low in the morning sky below Jupiter and is lost to view after mid-month. On January 1, Mercury is just over a hand-span above the eastern horizon half an hour before sunrise. 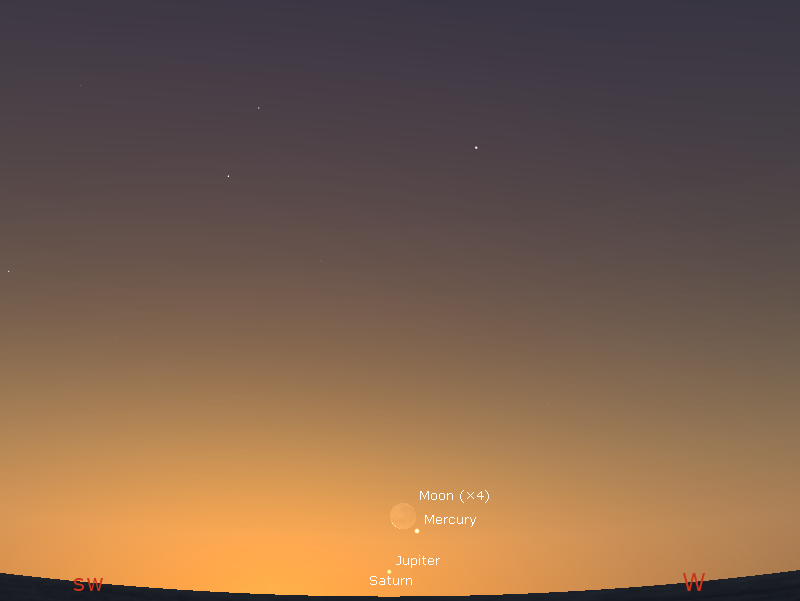 On January 4 the thin cresent Moon is between Jupiter and Mercury. January 15, Mercury is just over a three finger-widths above the eastern horizon half an hour before sunrise. At this time its is close to Saturn but you will need binoculars and a flat unobscured horizon to see the pair. After this Mercury is lost to view in the twilight glow. Venus climbs higher the the morning sky this month, with Jupiter coming close towards the end of the month. Venus is a distinct "half Moon" shape shape in telescopes at the beginning of the month and is gibbous by the end of the month. On January 1 Venus is just over three hand-spans above the eastern horizon an hour before sunrise. On January 2, crescent Venus and the thin crescent Moon are less than a hand-span apart. On January 15, Venus is just under three hand-spans above the eastern horizon an hour and a half before sunrise. On January 23 Venus and Jupiter are less than two finger-widths apart. By January 30, Venus is just over three hand-spans above the eastern horizon an hour and a half before sunrise. Earth is at perihelion on 3 January when it is closest to the Sun. Mars is still obvious but is substantially dimming and shrinking and is a challenging telescope object this month. Mars spends most of the time in Pisces this month. On January 1 Mars is just above 5 hand-spans above the western horizon an hour and a half after sunset. On January 13 Mars and the waxing Moon are close. On January 15 Mars is 4 hand-spans above the western horizon at hour and a half after sunset. On the 30th Mars is just under 3 hand-spans above the western horizon an hour and a half after sunset. Jupiter, climbs higher in the the morning sky this month, and comes close to Venus towards the end of the Month. Jupiter is in Ophiuchus at the start of the month then moves into Sagittarius. January 1, Jupiter is nearly a hand-span above the eastern horizon an hour before sunrise. On january 3 and 4 the crescent Moon is a hand-span from Jupiter. On January 15, Jupiter is just over two hand-spans above the eastern horizon an hour and a half before sunrise. On January 23, Jupiter and Venus are less than two finger-widths apart. By January 30, Jupiter is nearly four hand-spans above the eastern horizon an hour abd a half before sunrise. Saturn resturns to the morning sky late in the month. On January 15, Saturn is just over a three finger-widths above the eastern horizon half an hour before sunrise. At this time it is close to Mercury but you will need binoculars and a flat unobscured horizon to see the pair. On the 30th Saturn is just under two hand-spans above the eastern horizon half an hour before sunrise. The Quadrantids are a relatively reliable northern hemisphere shower, whose radiant lies below the horizon. They are difficult to see, but one can be rewarded by the (rare) sight of meteors shooting up above the horizon. The best time is to view between 4.00 am and 5.00 am, looking to the north east. A spotters map is here. The map shows the view to the east at 4.00 am (AEDST, 3.00 am AEST). This year there will be significant interference from Moonlight. There are no unaided eye comets visible at the moment. Comet 46P is visible in binoculars but is very low and effectively only visible from northern Australia for a couple of weeks. Comet 46P as seen looking north from Darwin at 1:07 ACST on Tuesday the 1st of January, when the comet is at its highest. Similar views will be seen in northern Australia (basically anywhere north of the latitude of Rockhampton, the tropic of Capricorn) at the equivalent local time. Comet 46P currently in the constellation Lynx but will move rapidly into Ursa Major. It is fading bot still is visible in binoculars and is currently magnitude 5. However, although relatively bright, its fuzzy, diffuse nature means it will be difficult to spot with the unaided eye under suburban conditions. Even under dark sky conditions it will be a faint fuzzy smear. In the new year it is only visible in northern Australia, anywhere on or above the topic of Capricorn. It is not near any obvious guide stars until the 11th when the comet is within a binocular field of the star omicron Ursa Majoris (see charts). A black and white spotters chart suitable for printing is here . A B&W chart suitable for binoculars is available here , the large circle is the approximate field of view of 10x50 binoculars. A list of current comet ephemerides is at the MPC. 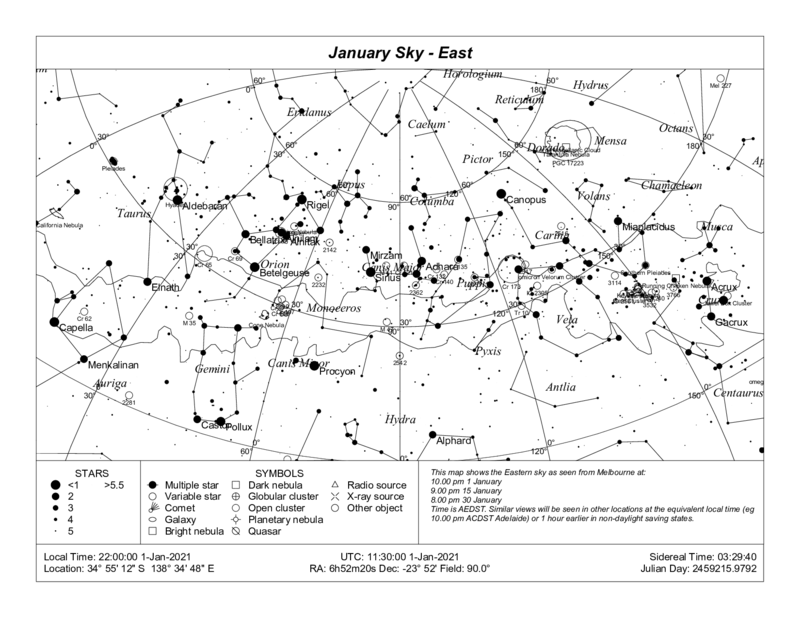 The southern evening sky at 10:00 pm AEST in Melbourne on January 1 (similar views will be seen from other cities at the equivalent local time eg 10:00 pm ACST Adelaide). All descriptions here are based on the view from Melbourne at 10.00 pm AEST (Australian Eastern Standard Time) on 1 January and assumes a fairly level horizon. Starset occurs progressively earlier each day, so these descriptions are valid for 9.00 pm on the 15th and 8.00pm on the 30th. Readers from other time zones should see roughly the same views at 10.00 pm local time. Corrections for cities other than Melbourne are given below. Facing west, the battered triangle of Capricorn, the Goat, is 3 hand-spans left of west, almost directly on the horizon. To the right by 3 hand spans and up by two hand-spans is Aquarius. 6 hand-spans up from the western horizon and three hand spans to the left is bright Fomalhaut, the main star of Piscinis Austrinus, the southern fish. Further off to the left is the battered cross of Grus the crane. The faint constellation of Cetus, the whale is just below the zenith stretching from the west to south-west. The Zenith is dominated by the rambling constellation Eridanus, the river, and bright Achernar, alpha Eridanus. Achernar is the 9th brightest star in the sky, and is a blue supergiant. Epsilon Eridani is notable for being the 10th closest star to our solar system. A sun-like star, epsilon Eridani has recently been discovered to have a dust disk which may indicate the presence of planets. On the eastern horizon are the constellations of Hydra, directly east, and rectangle of Gemini, 6 hand-spans to the left. 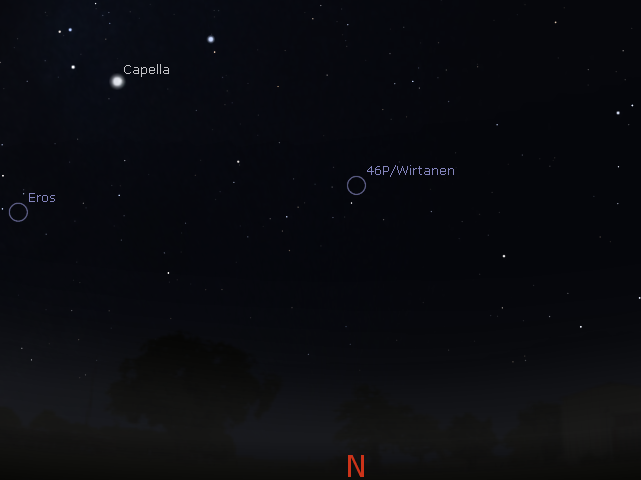 The bright stars of Gemini, Castor and Pollux, will not clear the Horizon until about an hour later. The constellations of Taurus, the bull, Orion the hunter and Canis major, Orion's hunting dog are now well above the horizon, and will be magnificent viewing later in the month, when the moon has waned. Directly east, 8 hand-spans from the horizon is Canis Major. The bright white star is Sirius (alpha Canis Majoris), the brightest star in the sky. The constellation of Canis Majoris has a number of open clusters that are well worth exploring with binoculars, Most of these lie two hand-spans to the right of Sirius, amongst the V shaped group of stars that marks the tail of Canis Major. Below Sirius by two hand spans, and one hand-span to the right is M47. This cluster is quite nice in binoculars. 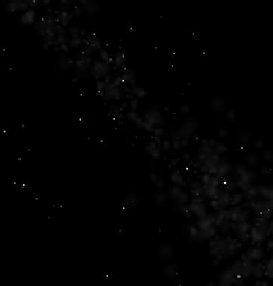 To the left of Sirius by about four hand-spans is the distinctive saucepan shape of Orion's belt. The handle of the saucepan is Orion's sword, which contains some good naked eye open clusters, and the final star in the handle hosts the famous Orion nebula, which is visible to the naked eye under clear skies. Directly above the handle of the saucepan is bright Rigel (beta Orionis). Directly below the saucepan is the bright reddish Betelgeuse (alpha Orionis), a red giant star. To the left of Orion's belt by about 4 hand-spans is Aldebaran (alpha Tauri), another red giant which forms the base of the V shaped group of stars called the Hyades, which forms the head of Taurus. Further to the left again is a faint, but pretty, compact cluster of stars called the Pleiades (the seven sisters). The Pleiades are particularly beautiful through binoculars. Facing directly north, about three hand-spans up is Perseus. Six hand-spans up is the Pleiades. The large square of stars that forms Pegasus, the flying horse is six hand-spans to your left on the north-western horizon. Andromeda, and the famous Andromeda galaxy, is two hand-spans below the bottom right hand star of the square, and one hand span to the right, near a faint star. Andromeda is best seen through binoculars or a small telescope on a dark night. However, as Andromeda is so close to the horizon, it may be difficult to see anything. Looking south, the bright, distinctive alpha and beta Centauri, the so called "pointers", are two hand-spans from the southern horizon, with alpha being the yellow star which is furthest from the horizon, and beta the blue white star below and to the left. Most of the rest of Centaurus, the Centaur, is too close to, or below, the Horizon to be seen properly. Alpha Centauri is the closest star to our sun at around 4 light years. However, recent measurements with the Hippacaros satellite put the system 300 million kilometers further away than previously thought. Alpha Centauri is actually a triple star, consisting of two sun-like stars and a red dwarf, Proxima Centauri, which is the closest of the triple stars to earth. Returning to alpha Centauri, following a line east through the "pointers" brings you to the Southern Cross, one and a half hand-spans from beta Centauri to beta Crucis, and two hand-spans above the horizon between the 7 o'clock and 8 o'clock position on a clock. A high definition map of Centaurus and Crux is here. The Southern Cross is, as expected, a cross shaped formation with Acrux (alpha Crucis) and gamma Crucis forming the long axis of the cross (pointing down to the south-east, with bright Acrux on the end of the axis away from the horizon). Beta and delta Crucis, forming a nearly horizontal line, form the cross piece of the cross. Just to the right of Acrux is the coal sack. This dark area against the glow of the milky way represents a large dust cloud and is usually clearly visible in dark skies, but will be hard to see this close to the horizon. The Jewel box in the Cross is a small open cluster just above Beta Crucis. It is quite beautiful, but requires strong binoculars or a small telescope to see properly, and is unlikely to be good viewing this close to the horizon. Above and to the left of the Southern Cross is Carina (the keel of the former constellation Argo Navis). A high definition map of this region is here. It is now far enough from the horizon to appreciate its many faint objects. Looking almost anywhere in the area of Carina will reveal an interesting cluster or star formation. However, the area between the Southern Cross and the false cross (which is just above the south-eastern horizon), is particularly rich. Here you will find the "Southern Pleiades" surrounding the tail star (Theta Carina) of a prominent kite shaped group of stars, with theta Carina two hand-spans up, and one hand-span to the left of Acrux. Smaller and less spectacular than their northern counterparts, they still look very nice in binoculars. Four finger-widths below the Southern Pleiades are two rich open clusters, and the barely visible star Eta Carina. Eta Carina's spectacular nebula is only dimly seen in binoculars. Two hand-spans to the left and four hand-spans up from the Southern Cross is the False Cross, seven hand-spans from the southern horizon. Just to the left of the False Cross is a good open cluster. Canopus (alpha Carina) is a bright yellowish star sitting 11 hand-spans above the south-eastern horizon (and about 4 hand-spans up from the False Cross. Vela, the sail of Argo Navis, and Puppis, the poop deck, (to the left and below Carina respectively) are now well above the horizon and their collection of clusters are quite visible now. When, Argo Navis was broken up into Puppis, Vela and Carina in 1750, they forgot to assign alpha and beta stars to Vela, and its brightest star at magnitude 1.5 is Gamma Velorum. Gama Velorum is a double star which may be resolved in good binoculars. The Milky Way passes through Vela, and there are many open clusters which can be seen with binoculars or the naked eye. One of the best of these is NGC2547, a little below gamma Velorum. Vela is also home to the spectacular Gum nebula (which can only be seen in telescopic photographs), and the second pulsar to be observed optically. Kappa and delta Velorum, with iota and epsilon Carina, make the "false cross" (about 7 hand spans above the southern horizon). A high definition map of Vela is here. To the left of the false Cross by about a hand-span is a good collection of the open clusters to be found in Vela, and two hand-spans further along brings you to another collection of clusters in Puppis. Directly above the southern horizon by 11 hand-spans is the extended nebulosity of the Large Magellanic cloud, the largest of the dwarf satellite galaxies. Binoculars will reveal a rather attractive nebula near it, the Tarantula nebula. To the left of this by 4 hand-spans is the Small Magellanic cloud, the second largest of the dwarf satellite galaxies to the Milky Way. This feature is best viewed on a dark night, away from the city. In this nebulosity is what looks to be a fuzzy star, this is 47 Tucana (marked 104 on the map), a spectacular globular cluster that is very nice through binoculars. To the right of the Small Magellanic Cloud by about 4 hand-spans is the dim constellation of Tucana, the Toucan, the parent constellation of 47 Tucana. 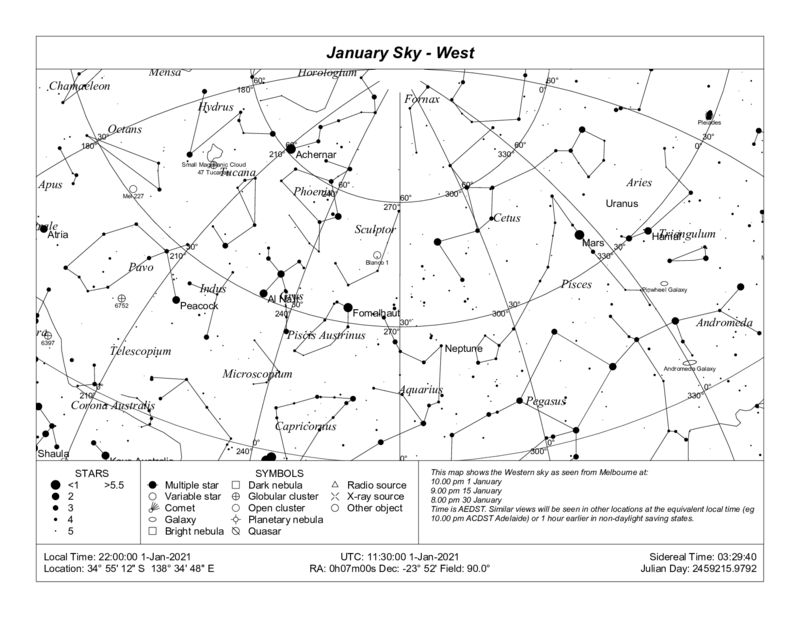 A view of the Eastern January sky at 10.00pm AEST on 1 January can be downloaded here (jansky_e.png 30 Kb) and a view of the western January sky can be downloaded here (jansky_w.png 30 Kb). These are more compact files but don't have a lot of resolution.